A Republican, William Howard Taft, won the presidential election of 1908. Along with his vice-presidential running mate, James S. Sherman (1855-1912), they defeated the Democratic candidate, William Jennings Bryan, and the Socialist candidate, Eugene Victor Debs, along with his Socialist Party running-mate, Benjamin Hanford. Under Taft's administration a postal savings system was established and dozens of antitrust suits were initiated. Taft also worked toward the passage of a Federal Income Tax and the direct election of United States Senators by the people. The former was enacted into law in 1913 via the 16th Amendment to the Constitution shortly prior to the end of his term. The popular election of Senators was also enacted into law in 1913 shortly after he left office via the 17th Amendments to the Constitution. This was not considered enough by the more liberal wing of the party, including Teddy Roosevelt. They bolted from the Republican Party in the election of 1912, and with Roosevelt as their candidate heading the Progressive Party ticket, split the three-way vote resulting in the election of Woodrow Wilson, a Democrat. In 1921, William Howard Taft was appointed Chief Justice of the Supreme Court by President Warren Harding. This was a position Taft had long wanted and considered it to be a greater honor than serving as President of the United States. 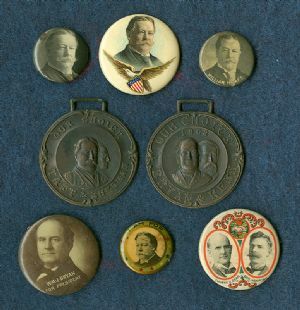 Featured among the buttons are two metal watch-fobs from the 1908 election. Both are labeled, "Our Choice". One features William Howard Taft and his running-mate, James Sherman, while the other portrays William Jennings Bryan, and his running-mate, John W. Kern (1849-1917). Bryan's campaign slogan in the 1908 election had been "Shall the People Rule?"